4 June 2013 -- Anonymous communications over the Internet have recently persuaded me to reevaluate the facts and conclusions contained in this article, “Dulles Airport” Shadow disproves US Government’s 9/11 Conspiracy Theory, with the result that I now repudiate and retract it. Now we know beyond a shadow of a doubt that the purported "Dulles Airport" 9/11 surveillance video is a complete fraud that was used to frame Arabs for the heinous crime of the century. Bibi Netanyahu has said more than once that 9/11 was "good for Israel"; does he also mean that a new and a real investigation of 9/11 will be bad for the Zionists? Read on! Nearly a decade after the heinous crimes known simply as “9/11” we can finally conclude with absolute certainty that our nation has been laboring under very strong delusion about what really happened that day. 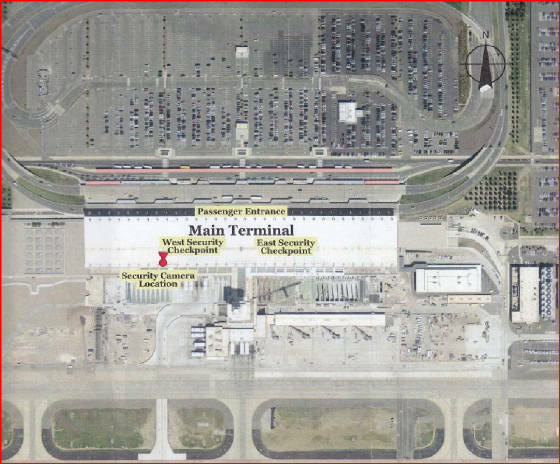 The Metropolitan Washington Airports Authority recently confirmed the location and view of the video surveillance camera at “West Security Checkpoint #1” at Washington Dulles International Airport on 11 September 2001. (See aerial photos below.) This new information helps call into question the authenticity of the video used by the Associated Press to promote the publisher’s release of the 9/11 Commission Report in 2004 and by the US Department of Justice to convict Zacharias Moussaoui in 2006. This surveillance video allegedly shows five Arab hijackers passing through the security checkpoint on their way to boarding American Airlines Flight 77 on the morning of 9/11. Now that we know for sure the camera pointed north and passengers walked south through the checkpoint, we have a reliable framework from Dulles Airport authorities in which to analyze the sun’s shadows cast by passersby seen outside the terminal entrance in the far background of the video. 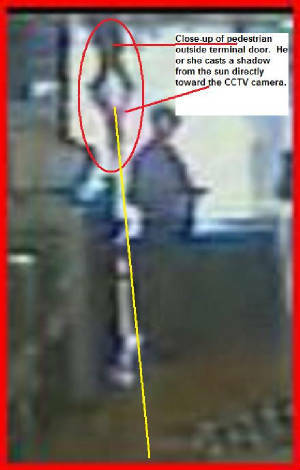 (See MWAA letter and still photo from surveillance video below.) These shadows are pointed south at a heading of approximately 180°, which means the sun had to have been rising very near the north cardinal point of the compass that morning. This of course is impossible and the only conclusion to be made is that the video is a total fraud. It could not possibly have been made at Dulles Airport, but was made elsewhere, at a place and time as yet unknown, and then falsely presented first to the public and then to a jury as having been filmed at Dulles. Whatever the true provenance of this purported “Dulles Airport” video, it staggers the mind to imagine a scenario not indicative of foreknowledge and preparation for the framing of Arabs in a classic “false flag” military intelligence black operation. Such a ruse to commence unjustified and immoral invasions and occupations of Afghanistan and Iraq is an act of treason at home and the supreme war crime abroad according to international law, particularly the 1950 Nuremberg Principles. In a very real sense, these invasions and occupations began at the airport gates on 9/11. Yet we have NEVER seen ANY credible video surveillance evidence of ANY of the passengers or hijackers at ANY of the three airports from which the flights of 9/11 are said to have departed. Think about that! Billions of people around the world were mesmerized by the images of two alleged hijackers passing through a security checkpoint, but few know the video came from Portland Maine International Airport. This Portland tape and the bogus "Dulles" tape are all we have in the category of routine airport surveillance video evidence for 9/11. How can this be explained? How could we have gone to war without demanding answers first? Where was the fourth estate? 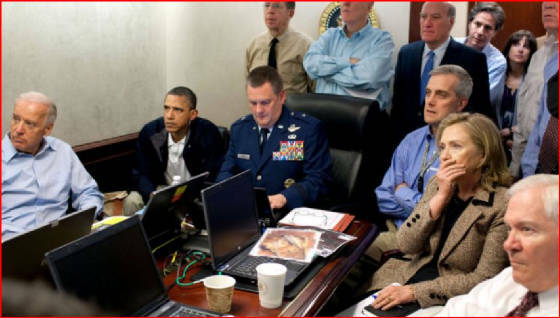 Now we know why our government could not respond in a forthright way to the Taliban’s good faith offer to hand over Osama Bin Laden upon presentation of evidence of his involvement in the crime of the century. Our government lacks evidence. It also lacks integrity. It did then; and it does now. The current administration countenances the manifest criminality of the previous one, and sixteen months after having been apprised of the bogus 9/11 “Dulles Airport” tape, it is at the very least an accessory after the fact. The bogus “Dulles Airport” video is just the tip of the iceberg of accumulated evidence undermining the official findings of the 9/11 Commission Report. It is unique, however, in that the video presumably has a chain of custody of evidence which will lead to the Praxis of Evil that actually pulled off 9/11 and the cover-up. But cornered rats bite! Indeed, the Co-Chairmen of the National Commission on Terrorist Attacks Upon the United States, Thomas H. Kean and Lee H. Hamilton, have already indicated in their book Without Precedent that they were “set up to fail” in their investigation of 9/11. What better argument can there be for the establishment of a new and a real investigation of 9/11? And what better way is there to conduct such an investigation than by the establishment of a 9/11 International Independent Investigation Commission and Tribunal? Is it not fitting and proper to examine by its very own methods the regime that pushed so very hard beyond all proper limits for the international probe into the Hariri assassination? An international judicial body is more apt to deal with the international components of 9/11 such as foreign infiltrations and espionage as well as high tech piracy of telecommunications, computer, radar and flight control systems. The sun and its shadows are unimpeachable witnesses at Dulles Airport, and basic astronomy and geometry give the proof of our government’s fraud and force. A choice now presents itself not just to citizens of the USA, but to all the nations of the earth. Do we follow the light in pursuit of 9/11 truth and justice? Or do we join or maintain the ignoble conspiracy of silence and of shunning surrounding this very grave matter? For me, the choice is easy. Let’s examine the events and circumstances of 9/11, the cover-up and the “shock & awe” doctrine. Let the truth be told, and let justice be done! The text and photos of this article are published at http://www.show-the-house.com/id107.html. Stephen M. St. John is a researcher mainly on Middle East peace and related subjects including 9/11. He maintains his website at http://www.show-the-house.com/. The aerial photo below was kindly provided by the Metropolitan Washington Airports Authority and shows the Main Terminal at Washington Dulles International Airport in relation to the main parallel runways that go north/south at 10°/190° headings. The aerial photo below of the Main Terminal at Washington Dulles International Airport was kindly provided by the Metropolitan Washington Airports Authority after being edited to show the location of the video surveillance camera at “West Security Checkpoint #1” and its view northward. 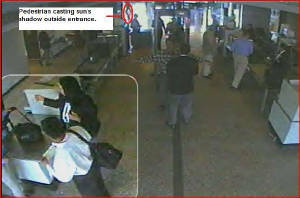 The photo shown below is a still taken from the United States Department of Justice Exhibit NT00211, the purported 9/11 “Surveillance videotape from Dulles Airport West Security Checkpoint #1.” The videotape, which the Associated Press used on 21 July 2004 to promote the publisher’s release of the 9/11 Commission Report the very next day, and which the US Department of Justice used in 2006 to convict Zacharias Moussaoui, was downloaded from the United States Courts website for the Eastern District of Virginia. Inasmuch as we now have confirmation from the Metropolitan Washington Airports Authority that passengers entering the terminal to catch flights come in on the north side of the terminal, and that on 11 September 2001 passengers going to the gates to board airplanes would have walked south through the security checkpoints, and that at that time, there was a video camera facing north focused on lane 1, we can readily see that the sun’s shadow cast by a passerby just outside the terminal entrance in the far background of the video (outlined in a yellow oval), points south at an approximately 180° heading. This means the sun had to have been rising very near the north cardinal point of the compass on the morning of 11 September 2001 in Herndon, Virginia. This of course is impossible. The video is therefore bogus. Please let me congratulate both of you on your reelections to the Parliament of Canada. Along with Martha Hall Findlay and Greg Thompson, who were not reelected, you replied to my e-mail about my discovery of 9/11 fraud through your aides L. Bisson (Manager, Ministerial Correspondence Unit) and Amal Chaaban (Constituency Office Manager, Edmonton-Leduc). Now I'd like to give you an important update. On 28 April 2011 the Clerk of the Supreme Court of the United States docketed my case against the US Department of Justice with number 10-10204. Inasmuch as this case revolves around my discovery of a bogus 9/11 "Dulles Airport" surveillance video, which is the subject of my original e-mails to you, and which is exculpatory evidence for Osama bin Laden, I believe you will understand my distress upon learning that the President of the United States, Barack Hussein Obama, ordered the cold-blooded execution of the star witness at any fair trial for the heinous crimes of 9/11 the very next day! On 29 April 2011, I sent e-mails to each of the distinguished participants of the Bellagio Forum 2011. I add to this e-mail for your information and perusal a copy (below) of one such e-mail to Judge Eugenio Raul Zaffaroni, Supreme Court of Argentina. Now that your reelection campaigns are finished, please let me ask you to focus on the issues that I've raised with a view toward action for 9/11 truth and justice. I address this letter to you and all other participants of the Forum Bellagio 2011. The 7 April 2011 Bellagio Declaration strives for the "effectiveness of interventions for the prevention and control of various forms of crime, conflicts and violence in the current global context." In the spirit of this worthy goal, I submit to you and each of your Bellagio colleagues a subject well within the range of your expressed interests. Specifically, I write to bring to your attention a very grave and urgent matter of state, which is proof that the United States Government framed Arabs for the crimes of 9/11 so as to create a pretext for war without real justification. The Obama Administration's 4 April 2011 decision to try Khalid Sheikh Mohammed at Guantanamo Bay in Cuba will only prevent a proper discovery process and perpetuate the BIG LIE and myth of 9/11. As a citizen of the USA, I hope you will carefully consider my information and analysis and share both with all of your colleagues and fellow citizens. Below is my short article, "Dulles Airport" Shadow disproves US Government's 9/11 Conspiracy Theory. Photos and links are provided, and are available also on my website at http://www.show-the-house.com/id107.html. For your convenience, I have also attached copies of the text with photos in PDF and MS Office Word 2007 formats. Also you will find copies of my resume in case I can be of further service. The foundation of a sovereign state is justice, and there is a moral imperative to root out fraud and prevent unjustified force. Therefore, I ask for your utmost attention to the issues that I present. I'd appreciate hearing back from you on this, and welcome your comments. Citizen of the United States of America Stephen M. St. John wishes to address the honorable and esteemed Members of the Senate and National Assembly of Pakistan with respect to their Joint Resolution #44 on the unilateral US Forces Action in Abbottabad on 2 May 2011. Citizen St. John deplores his government's action as a desperate attempt to circumvent truth and justice with regard to the heinous crimes committed in New York and Washington on 11 September 2001. He notes that the order for the high tech lynching of Osama Bin Laden was given on 29 April 2011, exactly one day after the Clerk of the Supreme Court of the United States had docketed his case against the US Department of Justice [#10-10204, 28 April 2011] in a matter revolving around a bogus 9/11 "Dulles Airport" surveillance video. 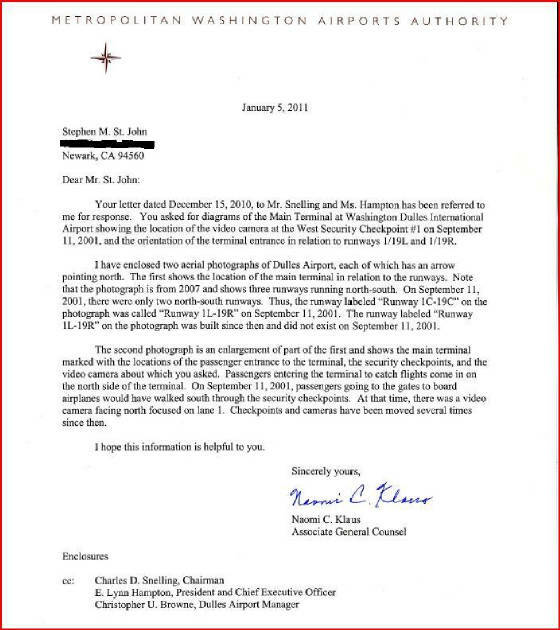 This fabricated video surveillance evidence, as shown in attachments to this e-mail and on Citizen St. John's website ("Dulles Airport" Shadow disproves US Government's 9/11 Conspiracy Theory at http://www.show-the-house.com/id107.html), was used to frame Arabs for the high-tech false-flag military-intelligence black operation known simply as "9/11." This fabricated video surveillance evidence is exculpatory evidence for Osama Bin Laden in any fair trial that might arise in the pursuit of 9/11 truth and justice. And so Citizen St. John asks the esteemed Members of the Senate & National Assembly of Pakistan, what conclusion can be drawn when the star witness at the trial of the century is snuffed out in a snuff film just three days after action at the Supreme Court of the United States threatens to pierce and penetrate the conspiracy of silence and of shunning built around this sensitive issue of warmongering fraud and force? In light of the foregoing, Citizen St. John urges the people of Pakistan and their representatives in the Senate and National Assembly to include a demand for a new and a real investigation of the events of 9/11, the cover-up and the "shock & awe" doctrine in the terms of engagement with the USA. May the Peace of the Almighty be upon you and the nation of Pakistan. Citizen of the USA Stephen M. St. John sends his greetings from San José, California, where, in 1910, the first radio broadcast station in world history began to operate. Just 23 years later, San José witnessed another first in world history; namely, a public lynching that was promoted and then broadcast by radio broadcast stations. This heinous crime was committed with impunity and celebration, and by this 1933 precedent the evil persists and today is manifested in the foreign policy of the USA, which relies on high tech command and control of information and communications. Such strong delusion is the devil’s game! Citizen St. John deplores the unprovoked and inexcusable attack on sleeping members of Pakistan’s armed forces in the middle of the night. Furthermore, Citizen St. John is concerned that reports of a renewed resolve to review Pakistan’s relations with the USA sound like dull echoes of similar determinations made in mid-May of this year. Moreover, Citizen St. John recalls with regret that his unsolicited advice offered after the Senate and National Assembly’s adoption of Joint Resolution 44 was not acknowledged or followed. Therefore, Citizen St. John repeats in a most urgent tone the same advice offered in May of 2011; namely, Pakistan must expose the BIG LIE about 9/11, which is the ultimate reason for the invasions of both Afghanistan and Iraq and the tumultuous state of affairs along Afghanistan’s borders. In this regard, Citizen St. John offers the Government of Pakistan proof positive that the US Department of Justice used a fraudulent 9/11 airport surveillance video to frame Arabs as one component of an elaborate ruse to fool the public and other nations into supporting the unjust invasion of Afghanistan under the guise of just retaliation. He concludes that the root of Pakistan’s current problem is the USA’s presence in Afghanistan under false pretenses. He therefore urges that Pakistan do its utmost to counteract the stultifying effects of the USA’s full spectrum information control by focusing on this root of the problem and exposing the 9/11 fraud. I find it necessary to bring to your attention a very heavy matter. It is a subject already suppressed by walls of silence and of shunning for almost four years. It will take courage not to fall into this pattern. Here it is: The purported 9/11 “Dulles Airport” surveillance video, which is cited on page 3 of the 9/11 Commission Report, is a fraud. I discovered this fraud in July 2009 by using Google Earth and applying basic knowledge of geometry and astronomy and common sense. Later, the Metropolitan Washington Airports Authority confirmed by letter (including aerial photographs) my surmise as to which way (north) the surveillance camera was pointed, which is crucial to interpretation of shadows cast by passersby outside the terminal entrance in the far background of the video. In the final analysis, there should be outside the airport terminal entrance a sidewalk and beyond the sidewalk a multi-lane roadway; instead, what you see in the video appears to be a wide sunlit plaza with people walking about in different directions. It was the direction of their shadows, and my view of the Dulles Airport terminal on Google Earth, that caused me to probe further into this matter and ultimately to conclude that the video is bogus. The wars triggered at the airport gates of 9/11 appear to be the result of universal deception. My discovery is exculpatory evidence for Sulaiman Abu Ghaith or any other member of Al Qa’ida. I do not mean by the foregoing statement to endorse Al Qa’ida or terrorism, but rather, I find it very much in the worldwide public interest to know why Attorney General John Ashcroft and Assistant Attorney General Michael Chertoff would want to frame Arabs with a bogus 9/11 airport video. Both men, I add, have made plenty of money in the fear mongering and war mongering industries. Also, Attorney General Eric Holder continues to dodge this grave issue by crafting the charges against Abu Ghaith in the Southern District of New York in such a way as not to challenge the official account of 9/11. What can you do about it? First, please read my short article “Dulles Airport” Shadow disproves US Government’s 9/11 Conspiracy Theory on my website at www.show-the-house.com/id107.html. Then put my discovery on official record so that it can no longer be totally ignored or suppressed by government or news media. I cannot expect miracles from you, but I do expect that you will not shirk the challenge that I present. I will be very happy (and relieved) to meet with you at your San José office. I write to express my concern about a forthcoming show-trial for Sulaiman Abu Ghaith and the danger of fraud and force supplanting truth and justice as the basic foundation of our sovereign state. In July 2009 I personally researched and discovered that the purported 9/11 “Dulles Airport” surveillance video (9/11 Commission Report, page 3) is fraudulent evidence handled by the US Department of Justice under John Ashcroft and Michael Chertoff. Briefly, missing structural features and angles of the sun’s shadows cast by passersby in the far background of the video prove that it could not possibly have been filmed at Washington Dulles International Airport on 9/11 or any other day of the year. Details, including edited aerial photographs and letter provided by the Metropolitan Washington Airports Authority, are at your fingertips to read at www.show-the-house.com/id107.html. There are many other significant problems with the official account of 9/11 that Sulaiman Abu Ghaith also deserves to know. Many of these problems are summarized in my 60 open letters to then Attorney General Michael Mukasey and in my 18 open letters to the current Attorney General Eric Holder. I urge Mr. Patton to avail himself of this information, which strongly indicates fraud and high tech cybernetic force on 9/11, at www.show-the-house.com/id54.html and www.show-the-house.com/id79.html. As a former Federal employee with the US Department of Commerce, I witnessed the immediate aftermath of the first hit on the north tower, WTC 1, from the side entrance of the Federal Building at Duane and Elk, within view of the old courthouse on Foley Square. Minutes later I saw the immediate aftermath of the second hit on the south tower, WTC 2, from inside the Federal Building in the southwest corner office on the 37th Floor. I made my escape for fear of my life. For others who were killed and injured, we must honor them with the pursuit of truth and justice and not with a bloody myth. I write to you in your capacity as chairman of the Commerce-Justice-Science Appropriations subcommittee, and designate copies of this letter to my US Representative for the 17th District of California, Michael Honda, via the contact form on his website, and to other concerned parties. Let me point out to you, Congressman Wolf, my July 2009 discovery that the purported 9/11 “Dulles Airport” surveillance video, which is prominently mentioned on page three of the 9/11 Commission Report, is entirely bogus. You can read my proofs in my short article “Dulles Airport” Shadow disproves US Government’s 9/11 Conspiracy Theory on my website at www.show-the-house.com/id107.html. This article includes input from the Metropolitan Washington Airports Authority in the form of edited aerial photographs and letter provided by the Associate General Counsel Naomi Klaus. Additionally, I have pointed out many of the significant distortions, omissions and outright lies contained in the 9/11 Commission Report in 60 Open Letters to Attorney General Michael Mukasey (www.show-the-house.com/id54.html) and 18 Open Letters to Attorney General Eric Holder (www.show-the-house.com/id79.html). Please avail yourself of this information, all of which was not considered by the 9/11 Commission and all of which should certainly be known to the FBI by now. It appears to me that the attacks of 11 September 2001 were never properly defined, and that an honest assessment of these terrible events in a new and a real investigation will reveal a high-tech cybernetic “false flag” black operation that was designed to stoke fear mongering and war mongering. There weren’t any “terrorist” attacks on 9/11, but rather a demented “shock & awe” program which has led us and other nations step-by-step to the borders of Syria and the abyss of thermonuclear war. Let our sovereign power rest on truth and justice and not universal delusion! Let me bring to your attention my July 2009 discovery that the purported 9/11 “Dulles Airport” surveillance video, which is mentioned on page 3 of the 9/11 Commission Report, is entirely bogus. My purpose in writing to you is to make sure that (1) this matter is properly treated as a crime; (2) you will avail yourself of this information in the “assessment of any evidence now known to the FBI that was not considered by the 9/11 Commission” according to Public Law 113-6 of 23 March 2013; (3) I will finally breach the walls of silence and shunning and be discharged of my duty to report serious wrongdoing. My short article “Dulles Airport” Shadow disproves US Government’s 9/11 Conspiracy Theory, including Appendix B (9/11 Airport Video Fraud for Dummies), gives the proofs for my very heavy charge that is fraught with vast national and international implications and consequences. This article, which features input in the form of edited aerial photographs and letter from the Associate General Counsel of the Metropolitan Washington Airports Authority, Naomi Klaus, is at your fingertips to read on my website at www.show-the-house.com/id107.html. Additionally, I have pointed out many of the significant distortions, omissions and outright lies contained in the 9/11 Commission Report in my 60 Open Letters to Attorney General Michael Mukasey (see www.show-the-house.com/id54.html) and in my 18 Open Letters to Attorney General Eric Holder (see www.show-the-house.com/id79.html). Please avail yourself of this information, all of which was not considered by the 9/11 Commission and all of which should certainly be known to the FBI by now. It appears to me that the attacks of 11 September 2001 were never properly defined, let alone punished. I believe that an honest assessment of these heinous crimes in a new and a real investigation of 9/11 will reveal a high-tech cybernetic “false flag” black operation that relied on telecommunications piracy. The purpose was to stoke lucrative fear mongering and war mongering and to serve an agenda for those who clearly had motive means and opportunity. There weren’t any “terrorist” attacks on 9/11, but rather a demented “shock & awe” program which has led the USA and other nations step-by-step to the borders of Syria and the abyss of thermonuclear war. There is a praxis of evil in our midst. But I am hopeful we can act to ensure that our sovereign power rests on truth and justice, not universal delusion. 9/11 "Dulles Airport" Video Fraud for Dummies! How do I know it was the sun casting shadows from the passersby seen outside the terminal entrance? Well, this is actually an educated guess on my part. The general brightness of the area seen outside the terminal entrance looks like sunshine. The shadows of all the passersby, both far and near, are pointing in the same general direction. Common sense tells me the sun is the source of light causing the shadows. But if you still have doubts about this, or if you believe the CIA can spin the earth so the sun rises in the north on a September morning in Herndon, Virginia, let me say there is other evidence that I have never before disclosed which is at least as strong as the shadows as proof positive the video could not possibly have been filmed at Washington Dulles International Airport. You see, if this purported “Dulles Airport” surveillance video was really filmed at Dulles Airport, you would see just outside the entrance a sidewalk and just beyond this sidewalk a roadway named Saarinen Circle after the Finnish-American architect of Dulles Airport’s Main Terminal, Eero Saarinen. Specifically, you would see the departures ramp and ground traffic such as automobiles, taxis and buses bringing passengers for flights scheduled to depart. Photos of the Main Terminal make this abundantly clear. But the video does not show any of these features that you would expect to see if it was really filmed at Washington Dulles International Airport. 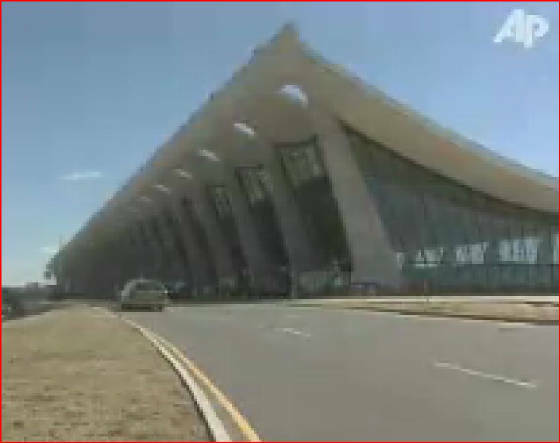 Below is a still photo from an Associated Press video of the Main Terminal at Washington Dulles International Airport. You see the north face of the Main Terminal where passengers enter and walk southward through the security checkpoint. The Dulles Airport surveillance camera pointed north but the bogus 9/11 "Dulles Airport" surveillance video does not show the sidewalk, the roadway or any motor vehicles which one would expect to see in the background. Instead, there is what appears to be a sunlit plaza outside the terminal entrance. Take a look at the bogus video and see for yourself!